New book, 80 pages, RAID25. In July of 1863, Federal forces, emboldened by the victories at Vicksburg and Gettysburg, moved across the Missouri state line south into Confederate-held Arkansas, advancing from the northwest and northeast in a pincer movement that took all of the northern half of the state, including the prosperous Arkansas river valley and the state capital at Little Rock, by September 11. Secure in their position, the Federals began to transfer men to the campaigns east of the Mississippi. 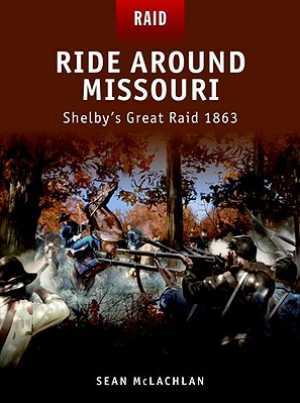 This new title's detailed and exciting account will highlight all aspects of the raid into Missouri planned by Colonel Jo Shelby, whose famed "Iron Brigade" was the boldest and most accomplished cavalry outfit in the Trans-Mississippi Theatre. An indispensible source for anyone interested in Civil War history.